'Song Of Norway' (Walter Luihn, R. 1977). Seedling# 76-5. TB, height 38" (97 cm). Midseason to late bloom. Ruffled silvery light powder blue self; deep bluebird blue beard tipped silver. 'Nobleman' X 'Blue Luster'. Luihn 1979. Honorable Mention 1981; Award of Merit 1983; American Dykes Medal 1986. From AIS Bulletin #233 Spring 1979 Introducing SONG OF NORWAY (Walt Luihn, 1979). #76-5. TB, 38", M-L. Nobleman X Blue Luster. Reminiscent of silvery blue icebergs and deep blue crevasses, we predict this tall Norwegian beauty will steal the hearts of all who see it, as it has been a "crowd-stopper" in our garden every year since its maiden bloom. 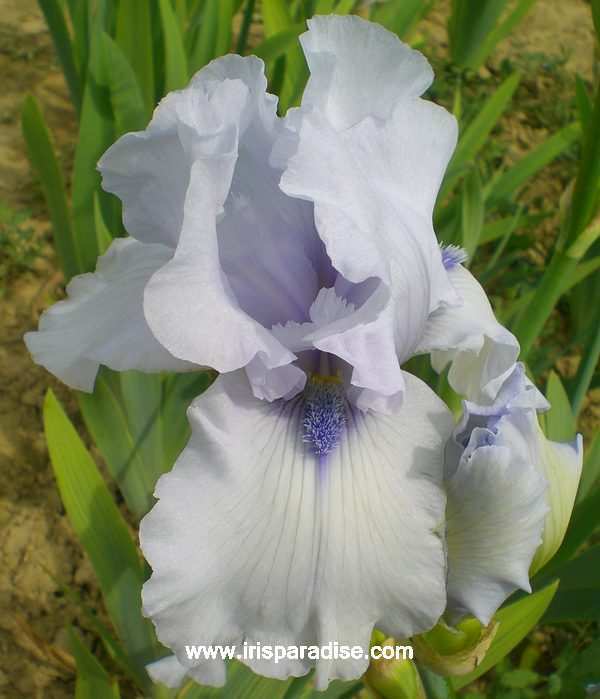 It is a ruffled, silvery light powder blue self, highlighted by a deep bluebird blue beard (RHS 042) tipped silver. As it reaches full maturity, it begins to very gradually "melt" to a lighter shade, which seems to further enhance the contrast of its rich blue beard. For those who like to capture Queen of Show, this icy beauty is a "must," as it is not uncommon to have three or more open blossoms on its well-branched stem. We have pictures to prove that, on occasion, it has had as many as five open flowers! HC 1978. $25.00. Luihn's Iris Garden. jpg SongofNorway14.jpg manage 145 K 12 Oct 2018 - 00:28 Main.TLaurin Photo by Sunshine Iris Nursery-Australia. jpg songofnorway2.jpg manage 46 K 10 Dec 2018 - 21:45 Main.TLaurin Photo by Iriszkert Szasz-Hungary. jpg songofnorway3.jpg manage 29 K 10 Dec 2018 - 21:47 Main.TLaurin Photo by Iriszkert Szasz-Hungary.